Bill & Ted 3 is officially on the way – with a release date of 21/08/20. 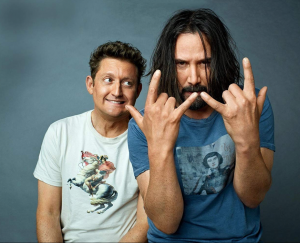 The full title is Bill & Ted Face The Music, and stars Alex Winter (Bill S. Preston) and Keanu Reeves (Ted “Theodore” Logan), otherwise known as the Wyld Stallyns, announced from the Hollywood Bowl that the film is officially happening. Bill & Ted Face The Music is being directed by Dean Parisot. The writers are Ed Solomon and Chris Matheson, who also wrote the first two movies: Bill & Ted’s Excellent Adventure and Bill & Ted’s Bogus Journey. According to IMDB William Sadler is playing the Grim Reaper, again!